It feels great to be getting wyld again with The Band in Bloody Rose, and like its predecessor, it’s sure to become an instant classic. With vibes of Almost Famous meets epic rollicking fantasy, this standalone follow-up to Kings of the Wyld follows Tam Hashford, a young woman with big dreams. Her father is a former mercenary who has become overprotective of his daughter ever since the death of his wife, who was a talented bard of some renown, strictly forbidding Tam to follow in her mother’s footsteps. Reluctantly honoring his wishes, our protagonist has never stepped foot outside her village she was born in, working a dreary dead-end job at the local pub. But that was before Fable, the most famous (or infamous) band in the world decided to roll into town. Starstruck by their leader, the fearsome Bloody Rose, Tam sweeps aside all promises ever made to her father, auditioning for the role of the band’s bard. Singing her heart out before those assembled, Tam wins the role on the spot. From then on, her job would be to accompany Fable on their tours, essentially adopting the position of rock journalist by recording the band’s adventures and spreading the news of their exploits to the masses. For the uninitiated wondering why I use that particular comparison, The Band is a gritty but comedic fantasy series from the brilliant mind of Nicholas Eames, who has injected a number of rock and roll musical references into his work. The traditional fantasy questing party is called a band. Instead of guitars and drumsticks, their members wield swords and warhammers. Gladiatorial arenas are their concert halls, where legions of adoring fans can see their heroes play live as they battle monsters to the death. Sometimes though, bands also take on contracts outside of their regular tours (they’re still mercenaries, after all) and at the moment, anyone who’s anybody is heading out to the Brumal Wastes, where the gig of a lifetime awaits in the form of a monstrous horde gathering at its edges. As Tam joins Bloody Rose and Fable, this is where she had assumed they would be headed. Everyone is surprised, however, when their frontwoman decides to honor their tour schedule instead, continuing onwards away from all the action. Needless to say, this decision is met with much disbelief and incredulity. After all, anyone who knows Rose knows how much she loves a good fight. While this novel can be read a standalone, those who read Kings of the Wyld may remember meeting her character briefly at the end when her father Golden Gabe and his band Saga came to her rescue at the siege of Castia. She’s never been one to shy away from battle, which is how she landed in trouble in the first place. And if she’s turning down the epic chance to fight the mighty Brumal Horde, then that must mean—as hard as it is to imagine it—she has an even bigger fish to fry. Still, even though this novel is named after Bloody Rose, the real star of the show is Tam. Our young and sheltered bard gets her dream job of traveling with the hottest band in town, gradually realizing that there is so much more to the lives of her idols as she becomes accepted into their inner circle. Rapidly dissipating are also her romantic notions of what it means to be a part of a superstar band, which isn’t all about the fame and glory. As Tam loses her innocent idealism, she also gains much in the form of wisdom, learning new things, falling in love, and seeing the humanity behind her heroes. Her bandmates are only mortals after all—flawed and fallible. They have hopes and dreams as well as fears and regrets. They are sons and daughters, brothers and sisters, mothers and fathers, and many of their family situations are as complicated and confusing as her own. That is also to say, this is definitely the kind of series where you come for the Rock ‘n’ Roll, but stay for the excellent character development and relationships. Despite the humor and the numerous nods to real life musical bands as well as pop culture references aplenty, Eames has proven that this is all more than just a gimmick, and that he is more than just a one-hit-wonder. His books are loads of fun, but there is also real feeling in his unique brand of storytelling which gives depth to his plot and characters, and that is a talent sure to send him straight to the top of the charts again and again. In sum, Bloody Rose was a supremely entertaining romp, and I daresay it might have even surpassed the greatness of Kings of the Wyld. Trust me, fantasy fans, this is one series you do not want to miss. Looking forward to the next installment of The Band, and I can’t wait to see with whom or where we’ll be touring next. And now time you’ve all been waiting for! 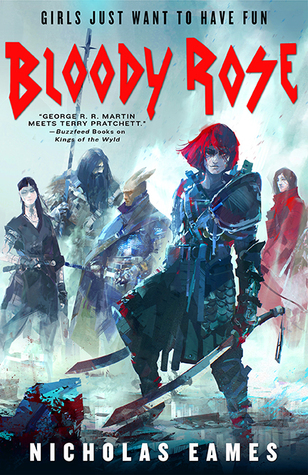 I have a copy of Bloody Rose that I’m putting up for giveaway. With apologies to our international readers, due to the costs of shipping, this giveaway is only open to residents of the US. One winner will receive a paperback copy of the book. To enter, all you have to do is send an email to bibliosanctum@gmail.com with your Name and valid Mailing Address using the subject line “BLOODY ROSE” by 11:59pm Eastern time on Saturday, September 15, 2018. Oh, yikes. Nothing like that in this one, don’t worry! Oh it’s great that this second book was so good there! I hope you’ll have the next one soon! I enjoyed Kings of the Wyld and am curious about this too. I really like that the group of fighters are like a rock band in some ways. Yes, it’s such a cool idea! Amazing how well it works in a fantasy context too! I love the look of this series and can’t wait to pick it up. Good luck to all your contestants. Agreed! Glad to see the word is spreading! For sure, the talent to balance all of that is what distinguishes a great author, imo. Totally agreed with everything you said! It seems very good and I am very eager to read the serie. They told us the title will be translated so I wait to rad it later. Awesome! Hopefully it’ll be translated into many languages, the world needs more of The Band! Yes yes yes, your review killed it! I couldn’t get enough of this book and I was pretty nervous (albeit more excited) to see if it could live up to the first one, but it positively KILLED it. I’m so excited to see how he rounds out the series in book three. Good luck to all your contestants and thanks for being kind enough to host a giveaway of an awesome book! I am still bouncing back and forth between which one is “better.” I honestly don’t think I can pick one definitively. I just loved the first one *so much*, but you’re right, this sequel killed it in every sense of the word. So I’m right there with you! I have no excuse for not starting this series. I loved reading your review and am even more excited to read it now! You pretty much nailed it!! I loved the character dynamic in Kings of the Wyld, but I think this one did an even better job with the character exploration. 100% agreed. Kings of the Wyld was fun, but this one felt like a step up in terms of character development!